Israeli Prime Minister Benjamin Netanyahu declared a "tremendous victory" in the country's tight election race Tuesday. 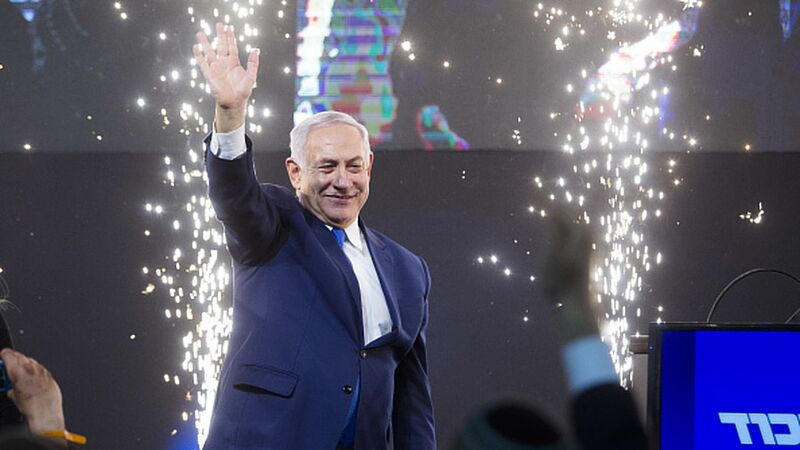 What he's saying: "It will be a right-wing government, but I will be prime minister for all," said Netanyahu, whose Likud party tied in seat numbers with Benny Gantz's Blue and White, according to exit polls. "I'm very touched that the people of Israel gave me their vote of confidence for the fifth time, and an even bigger vote of confidence than previous elections." Details: With 97% of the votes counted, Netanyahu's party won 35 seats in the Knesset — the same amount as Gantz's Blue and White party. But Netanyahu was set be the one forming the next government owing to the fact that the right-wing bloc won 65 seats overall against only 55 seats to the center-left bloc. What's next? In the next few days, President Rivlin will start the process of consultations with the different parties, but it will be almost a formality. Almost all the right-wing parties already announced they would recommend that Netanyahu forms the next coalition.